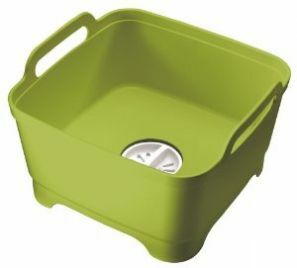 The Wash and Drain bowl It has an integrated plug which means water can be quickly drained away, eliminating the problem of lifting and emptying a heavy bowl. The plug can also be set to strain the water for food particles, allowing them to be easily disposed of and helping to prevent sink blockages. Its steep sides help keep water and soap suds safely inside and large carry handles mean it can be easily carried. Perfect for use in the sink or for washing dishes anywhere. Ideal for family camping trips taking on picnics.